Apartment located in an antique building, completely renewed. The building has a terrace, BBQ and laundry. We stayed in this apartment for a month and really enjoyed it. 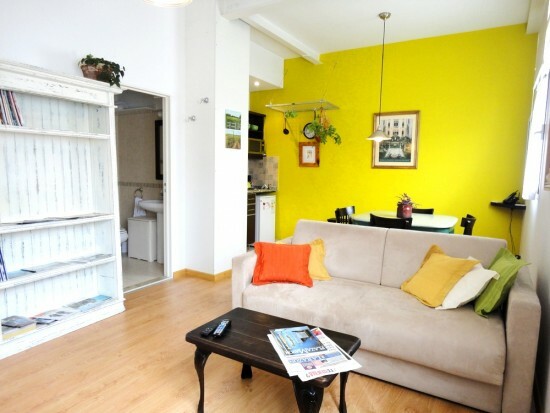 The location is fantastic - so convenient for San Telmo market, Plaza Dorrego and a million cafes, restaurants, local supermarkets, carnicerias and fruit and veg shops. Despite being at the heart of everything, it is a really quiet space inside, which was very important for us. It was clean, brightly decorated, well equipped and secure, and having a laundry room was an added bonus. We also enjoyed a lovely evening having a parrilla on the roof terrace. The owner, Susana, is extremely helpful, communicative and efficient. At one stage there was a problem with the internet company, and she did not give up until it was resolved - a new company was brought in and a new wifi modem installed in the apartment. Recommended. El departamento proporciona unas prestaciones muy adecuadas. Es íntimo, silencioso y confortable. El lugar es muy tranquilo y con muchas posibilidades de ocio y lugares agradables al turista. El trato, tanto de la agencia como de la propietaria es muy satisfactorio. Gracias y espero poder decir "hasta pronto". Mi experiencia en el departamento es positiva. La atencíón por parte de la Agencia fue rápida y correcta. La equipación es muy satisfactoria y tanto el edificio como la ubicación son tranquilos. Todo muy recomendable. Gracias.